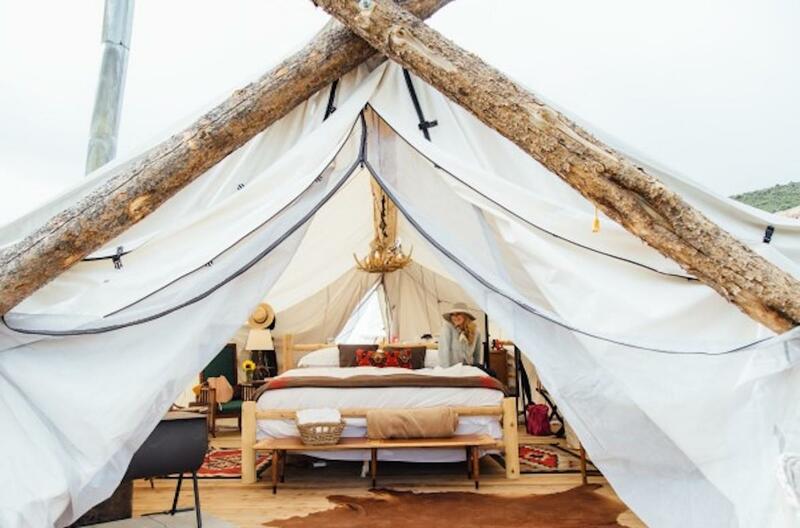 We’ve scoped out camp sites from Tanzania to Uluru, Malibu to Belize, Ithaca to the United Kingdom, bringing you 52 of the world’s best glamping spots. 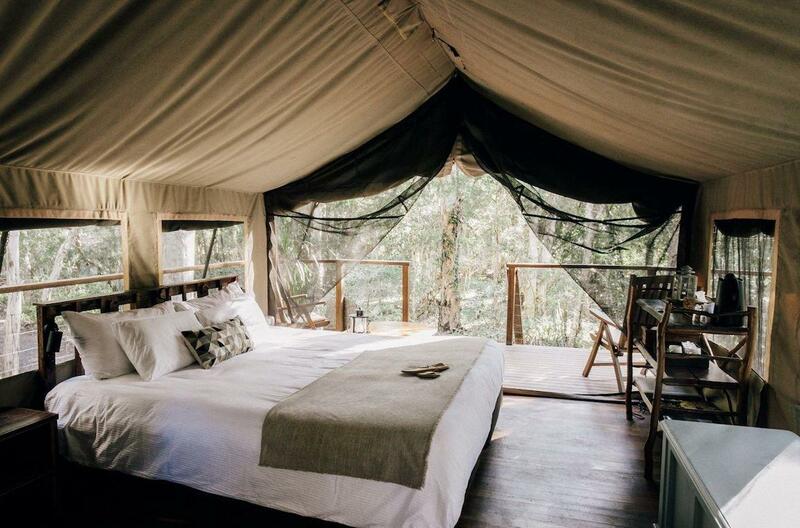 Ranging from low-key rainforest cabins to the ultimate in luxury safari trips, we’ve got glamping options for every week of the year. 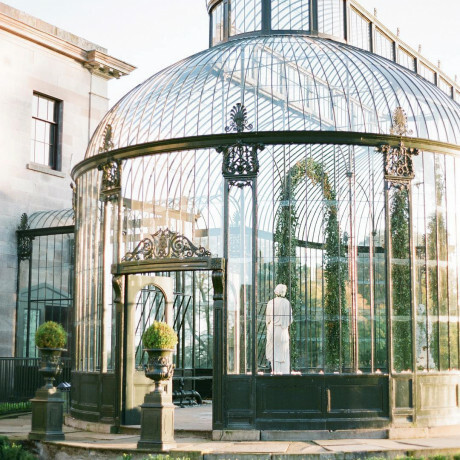 Come along and explore with us! 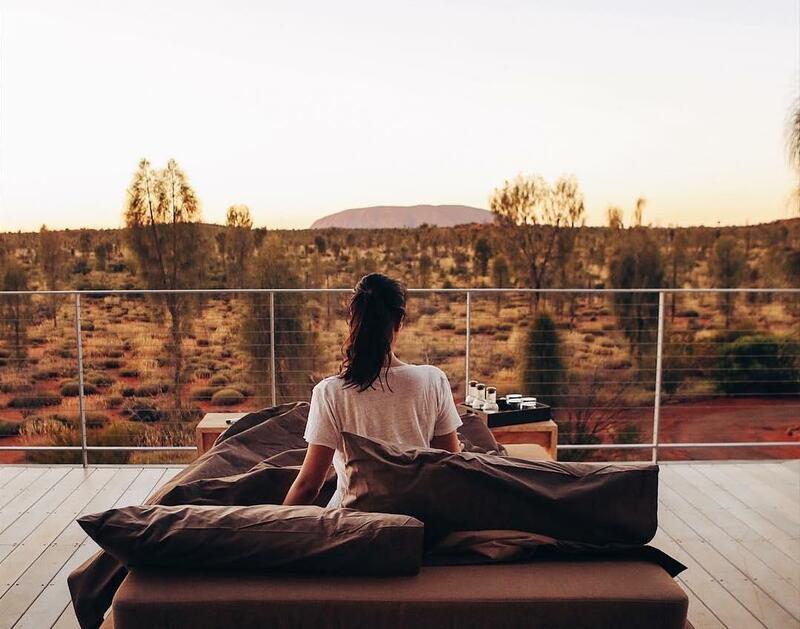 Deep in the outback of Australia, Uluru is a giant majestic rock that towers over the flats surrounding it. 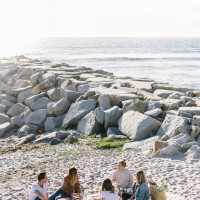 For adventurers looking for an authentically Aussie luxury experience in the unfettered landscape of Australia’s most famous rock formation, Longitude 131 is one of the best glamping spots in the country. 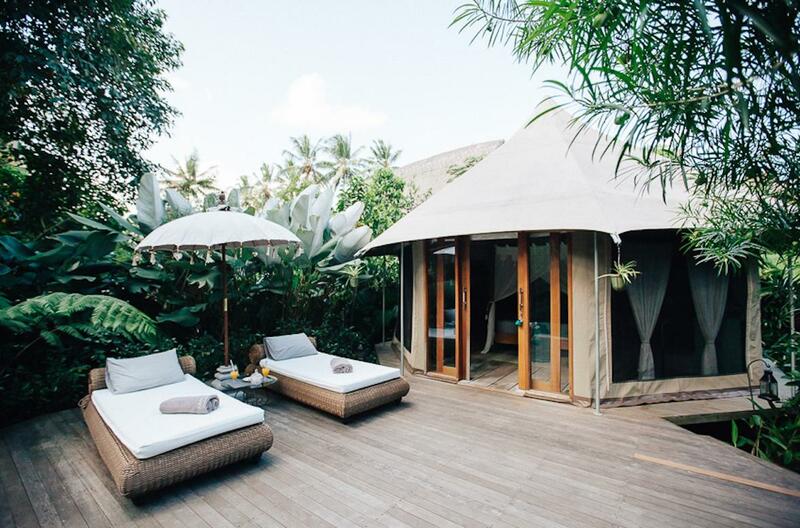 Set in the expanse of Bali’s oh-so-green rice fields, this handful of safari tents is luxurious but also authentic to the local scene. 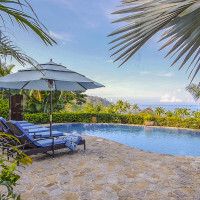 Visitors can expect to feel pampered while working on their yoga practice and meditation. Tulum is one of our favorite destinations for a quick weekend getaway that feels worlds away from home. 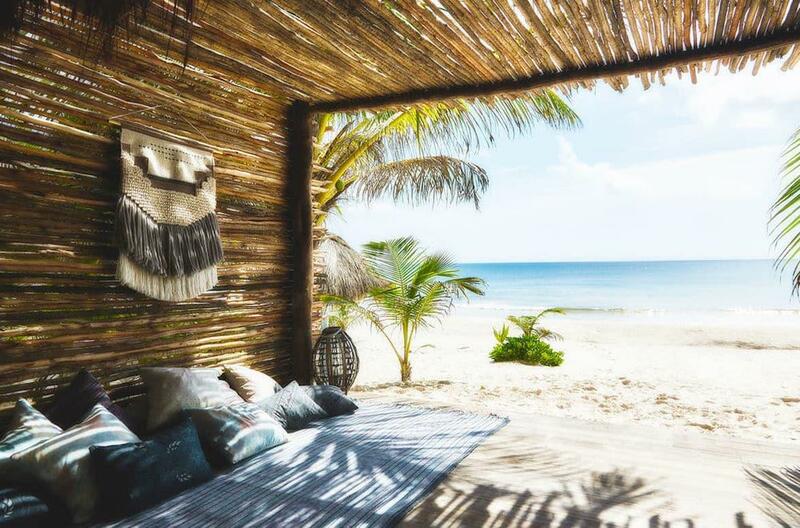 Nomade features a collection of grass-roofed huts and cozy canvas tents on the Caribbean side that feel like they’re tucked right into the landscape. 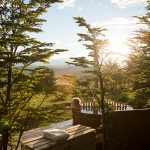 Looking to escape NYC for the Catskills this spring or summer? 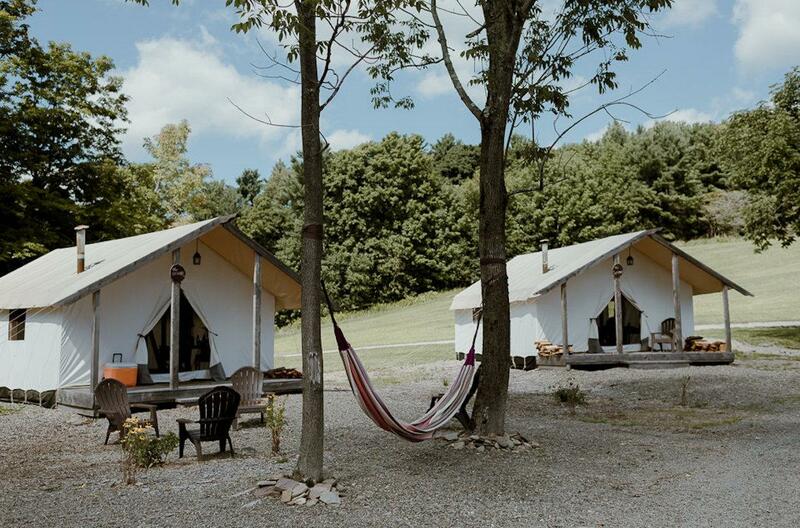 Check out Gilbertsville Farmhouse, one of the best glamping spots in Upstate New York. You can even practice yoga while miniature goats roam alongside your downward dog. 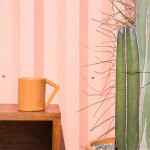 When the desert calls, we listen. And boy do we listen big when it calls from a resort this gorgeous. 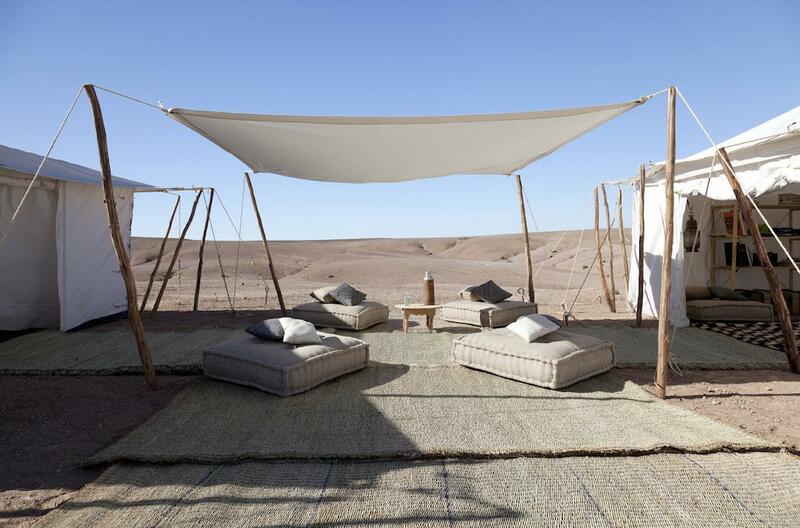 A dozen canvas tents filled with local Moroccan design tidbits, Scarabeo Camp is a world away from the city center. 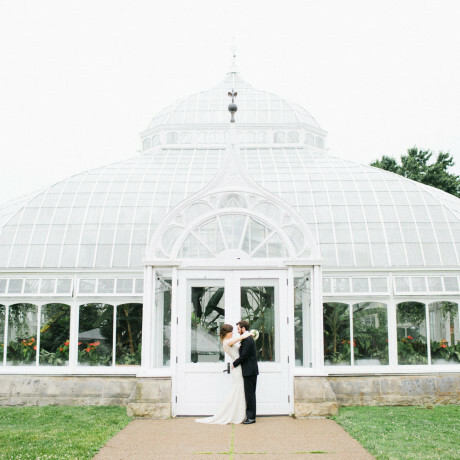 Dare we say, it’s an oasis all its own. Montana’s Big Sky is best experienced via a camping trip to see the night stars and breathe in that crisp, fresh air. 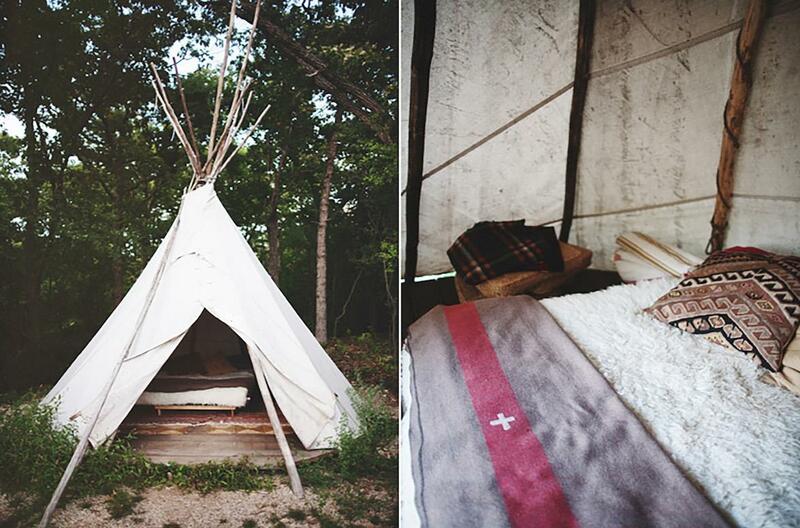 Why camp when you can glamp, though? 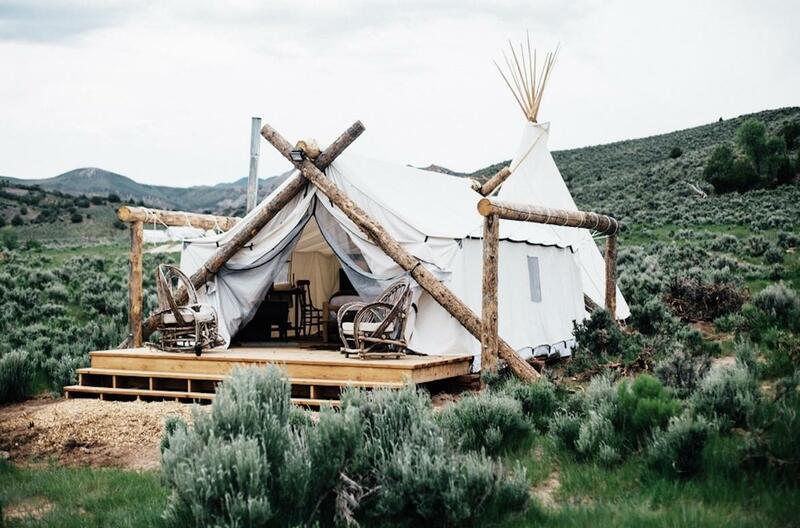 Head to Yellowstone Collective Retreat for all the perks of camping mixed with all the luxury of staying at a high-end hotel. 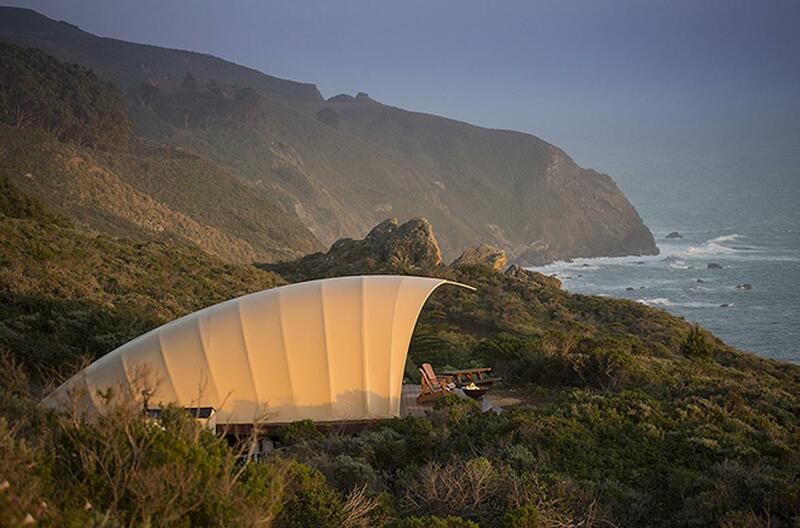 Malibu’s Zuma Sanctuary is prime real estate for a glamping trip. 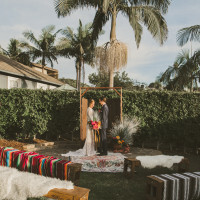 Set just on the mountain’s edge overlooking the Pacific, this spot has a couple of cool, decked out silver-bullet Airstreams and a couple of glammed up bell tents too. For anyone on the hunt for a safari spot that immerses you in the local scenery, check out Singita Mara River Tented Camp in Tanzania. 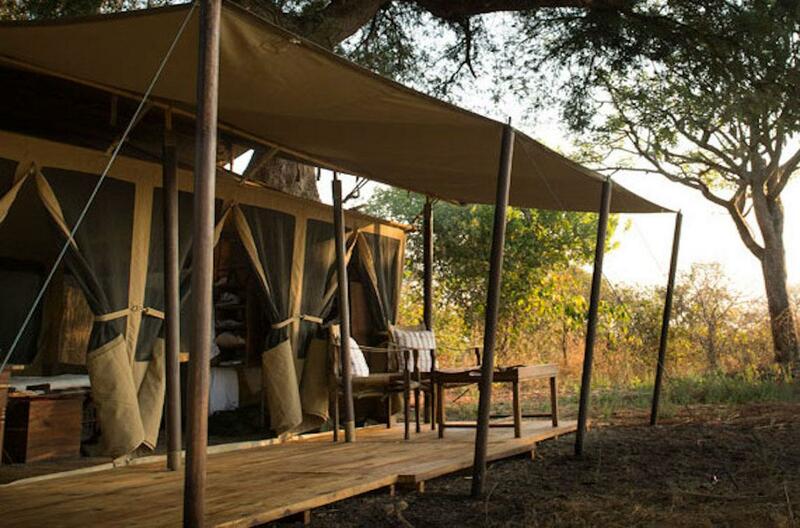 With just six luxury camping tents on-site, you can rest assured that this experience in the African wilderness will be the finest on offer. 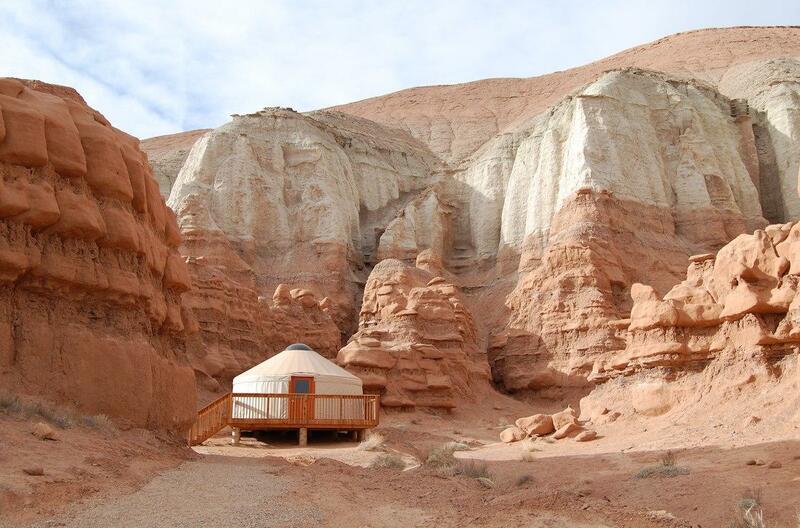 This campsite in Utah’s Goblin Valley has space for you to pop up as many as 25 tents of your own, or you could opt for the golden option and book one of the two on-site yurts. 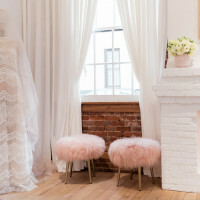 Though not known for being glamorous, these tents are convenient, affordable and pretty darn cozy in their minimalist style. 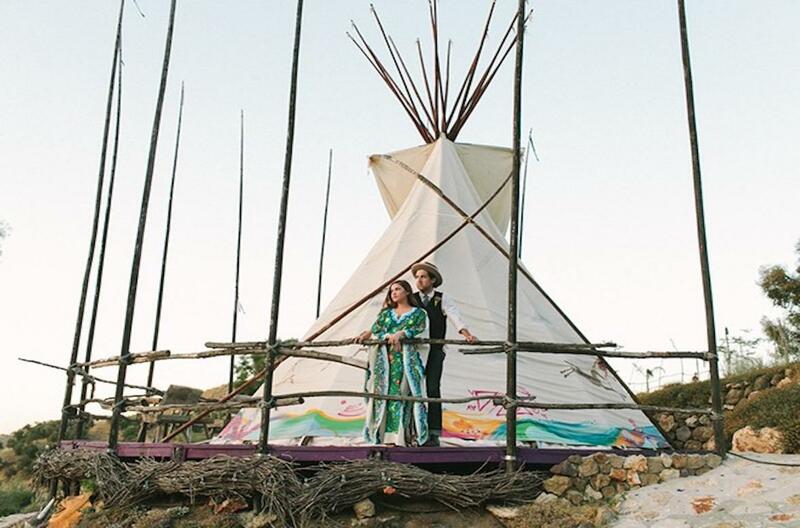 Deep in Joshua Tree country, there’s a strange little movie set town known as Pioneertown. 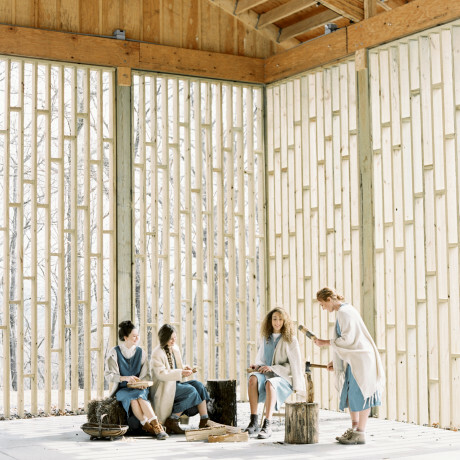 Cultus Camp sits in the mix, on a sprawling preserve of desert. 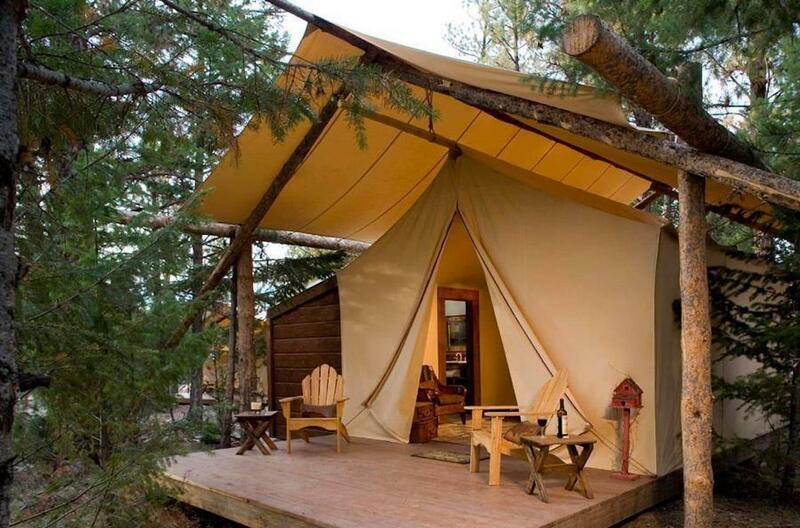 A huge glamping cabin that’s just the right size for a couple on vacay, this spot feels luxurious in its seclusion. 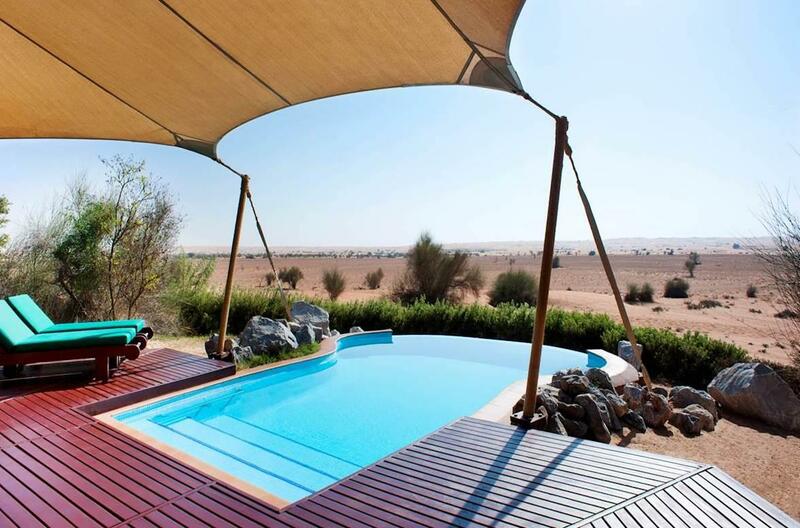 We’re willing to bet that the United Arab Emirates may not be on your must-see list, but we’re thinking this Dubai desert resort may have you reconsidering. 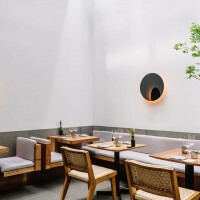 With various awards in their back pocket, Al Maha is a chic sanctuary that reflects Bedouin design elements and offers up a truly high-end experience. You’re a newbie to this whole glamping thing, eh? 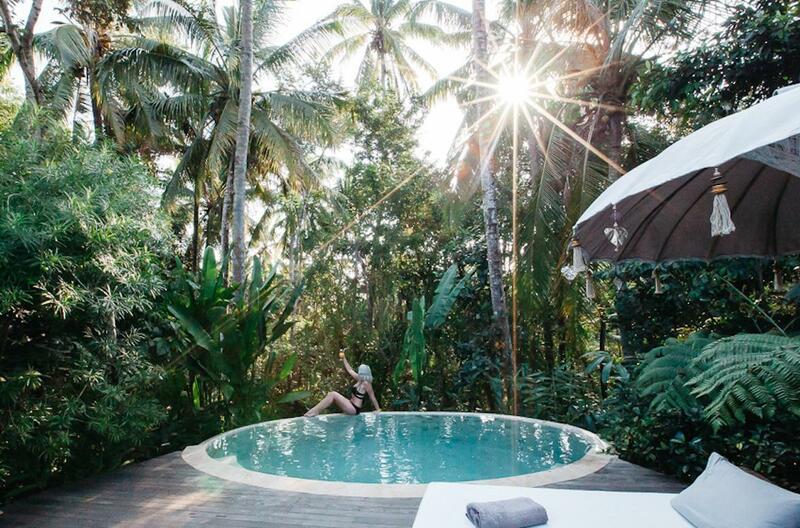 Well, this Australian hinterland spot is an awesome place to kickoff your new favorite weekend hobby. 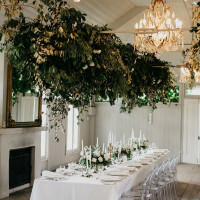 Paperbark Camp is made up of about a dozen luxury safari-style tents set in the forest alongside a treehouse restaurant. 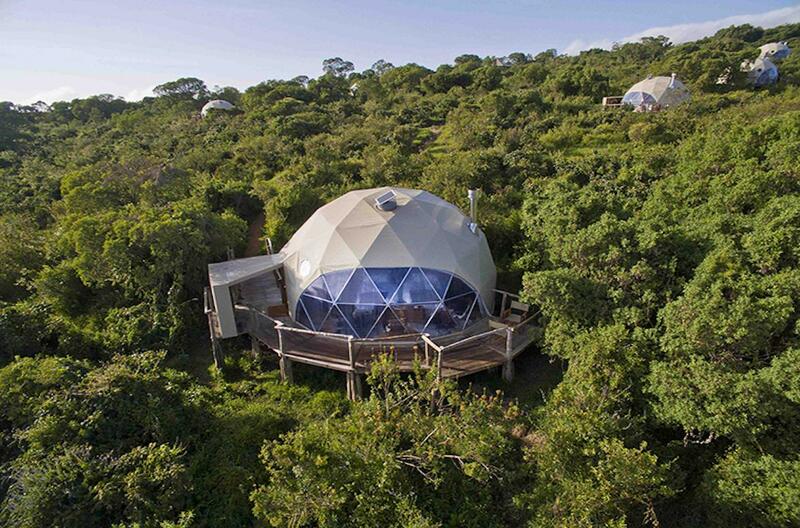 Tucked into the wilderness of Tanzania, the 8 domed tents that make up The Highlands look out onto mountains, valleys, a volcano and a crater. If exploring the wildlife and indigenous culture of the Serengeti have ever been on your bucket list, this spot is a must-see. 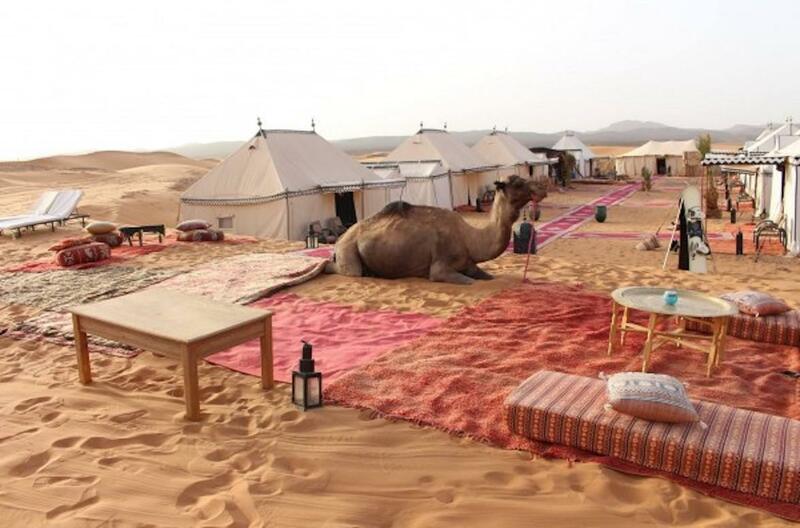 Deep in the Moroccan desert sits a gorgeous little luxury camp that glows at night and shines with colorful rugs and décor by day. 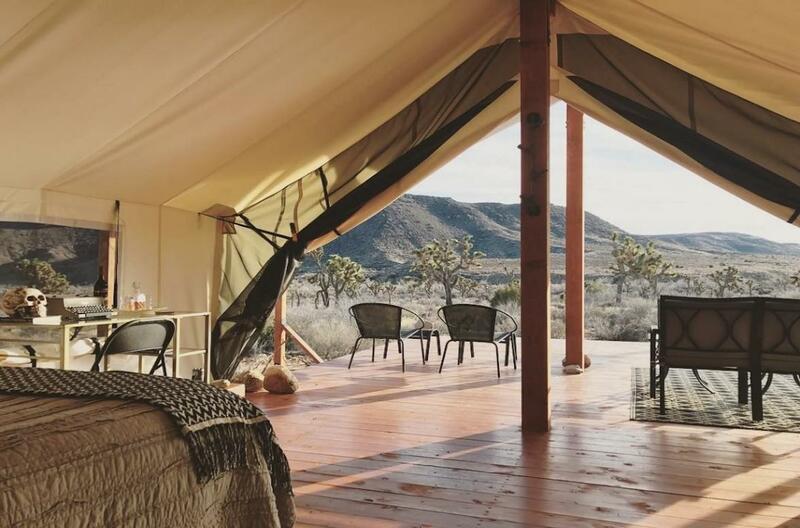 Whether you ride camelback or take a 4-wheel drive car to get there, the Desert Luxury Camp is a far cry from “roughing it." 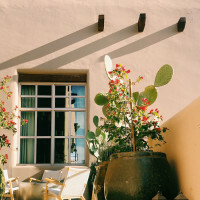 For those who enjoy summer stargazing and wine sipping, Baja’s bubble hotel in the vineyards is one to add to the bucket list. 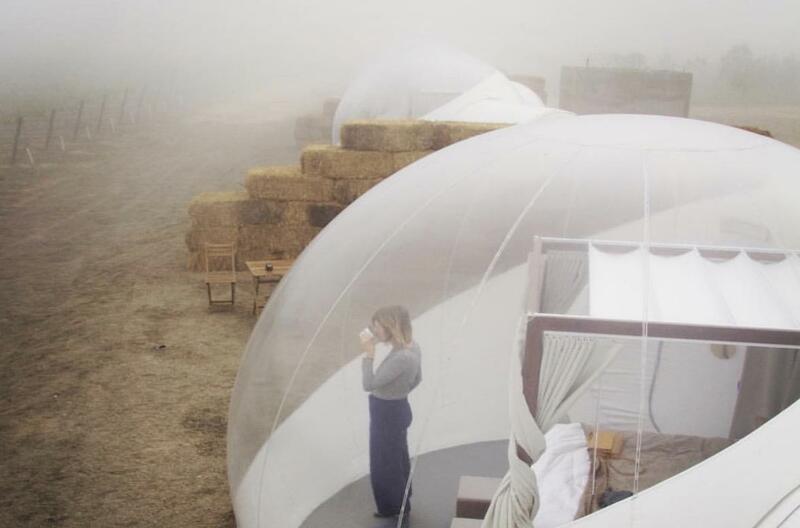 Explore the local wine route by day and sleep in a clear bubble tent by night under about 5 million stars. 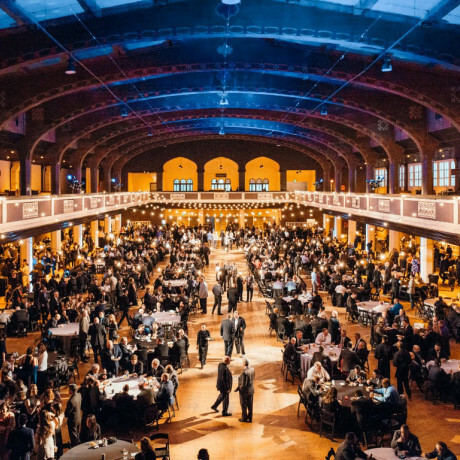 Located just outside Chicago, this former mobster paradise is now a pretty cool spot for a getaway weekend that’s steeped in history and has that nostalgic feeling of hanging out at an old summer camp on the lake. 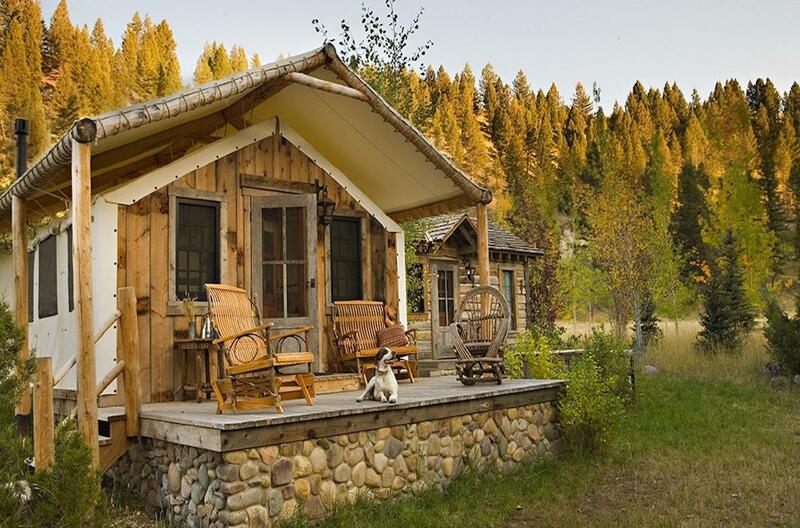 Check it out for the cute cabins that are authentically vintage and down-home, but don’t get it confused for a luxury experience. 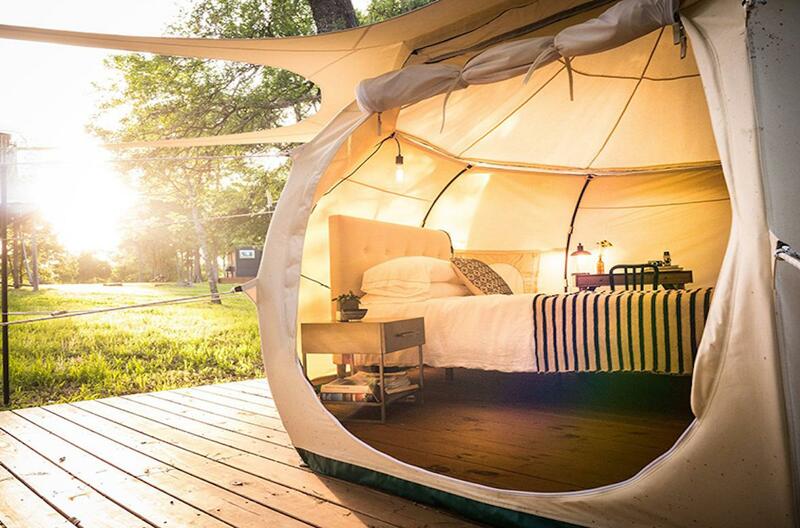 There are a million things we think of when we think about taking a trip to Austin and now we can add glamping to the list. Green Acres is home to a couple of very cool yurts and a “tiny house” dubbed the Spartan Mansion. 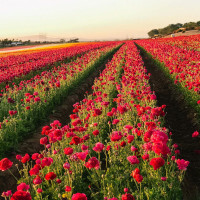 Check it out if you’re down to get away from the crowds and experience that Texas countryside vibe. If you’re anything like us, you love the scenery of Vail but hate the crowds. This small retreat outside of town is a great alternative to the busy hotels of the famed ski destination. 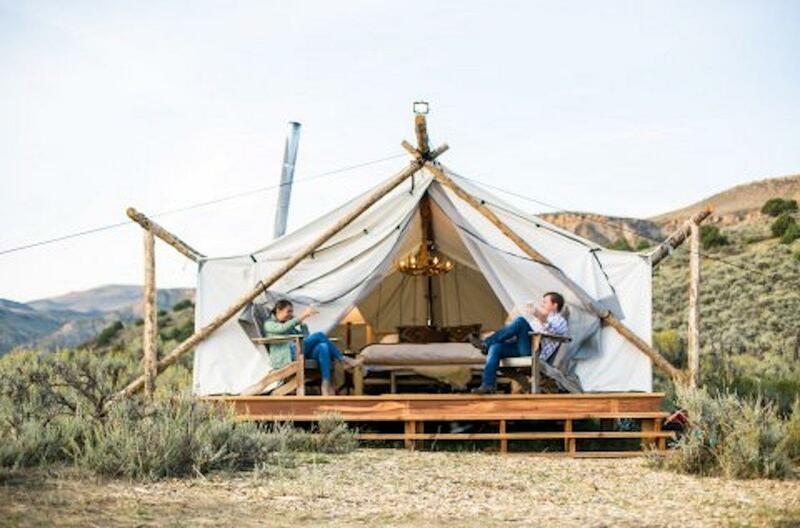 With a collection of design-savvy canvas tents set alongside campfire sites, Vail Collective Retreat celebrates the beautiful wilderness and mountain ranges of this gorgeous area. Modeled after the luxury exploration camps of the 1920s, this Tanzanian safari camp is decked to the nines in gorgeous décor and surrounded by plentiful wildlife. Don’t be surprised if a zebra wanders past while you’re sipping your morning coffee overlooking the savannah plains. Jack’s Camp sits on what was once one of the world's largest super-lakes, the Makgadikgadi, which dried up thousands of years ago. The prehistoric setting is now home to tons of wildlife and a stunning setup of ten luxurious Bedouin-style canvas tents. 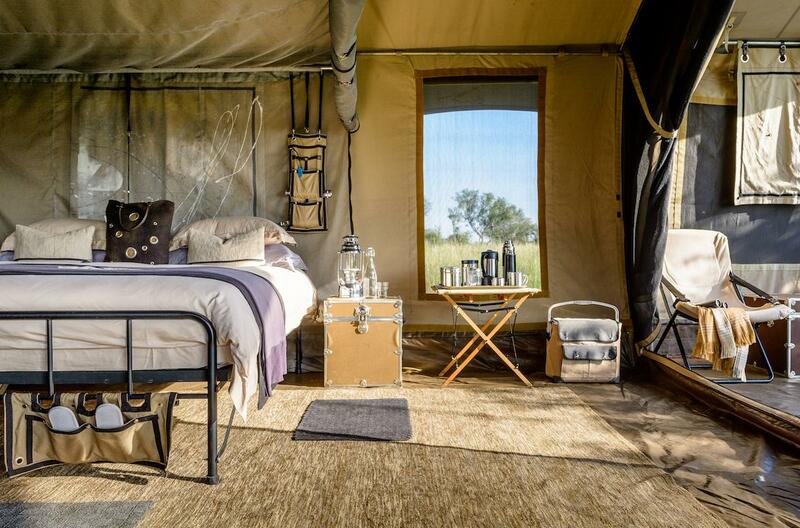 Expect a once-in-a-lifetime safari experience at this Botswana site. 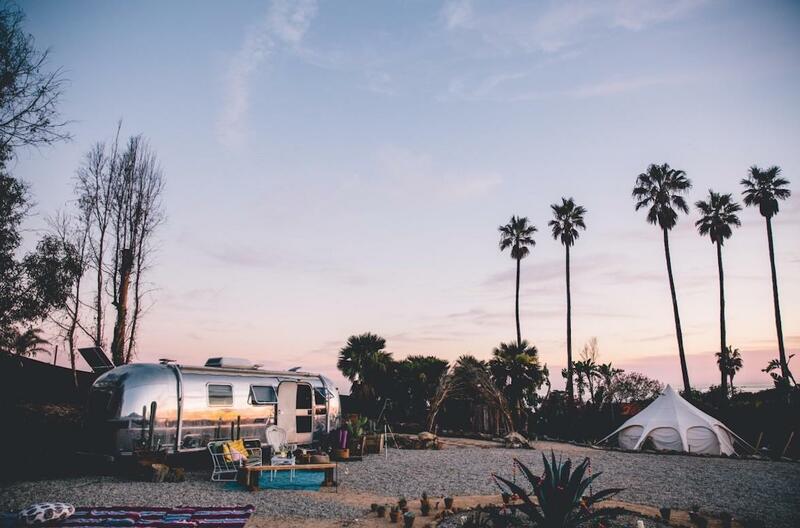 This 1960s style Airstream park in San Clemente has us dreaming of yesteryear and that good old California beach life. 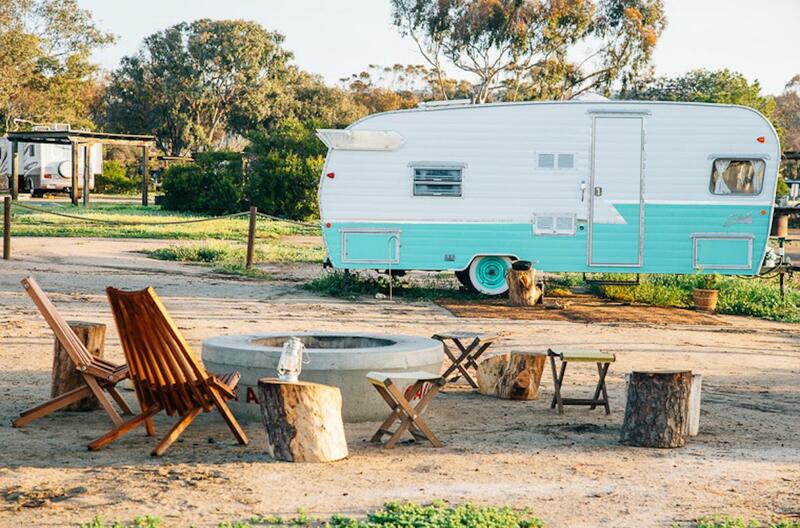 Rent an RV or a couple for your crew and glamp it up in this coastal setting. 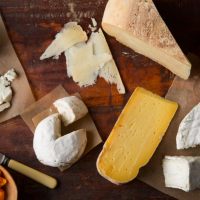 New to the Sonoma scene, Collective is set to open later this year. The Cloverdale digs will feature gorgeously appointed canvas tents as only the Collective squad can do. 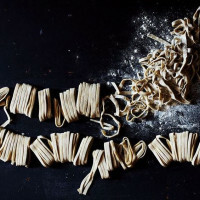 Lest we forget to acknowledge the gazillion things there are to do in this wine and food centric region. 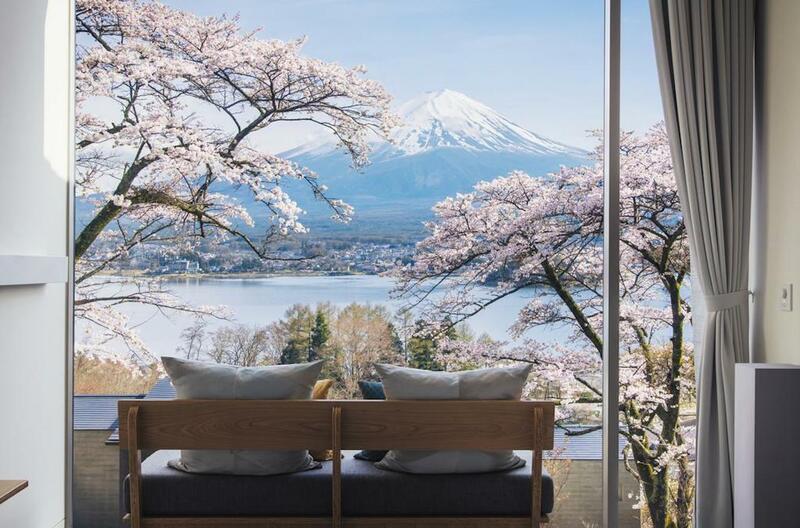 Japan’s first official glamping resort, Hoshinoya sits right on Lake Kawaguchi and has meticulously planned out every last detail to ensure your glamping experience is the ultimate. 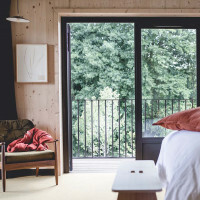 With stunning spaces inside and out, incredible food and wine, and modern cabins that blend right into the landscape, this destination is absolutely worth a trip across the world to scope out. 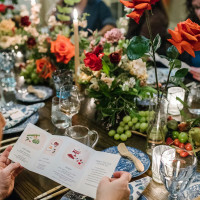 If you’re into the idea of camping but can’t stand to travel with a tent and really love your creature comforts, Thailand’s Four Seasons Tented Camp in the jungle of Chiang Rai might be right up your alley. 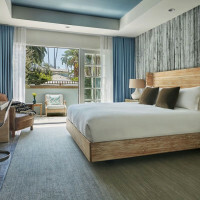 A luxury getaway that’s got a cocktail bar and wine cellar on-site, you won’t feel too campy at this spot. 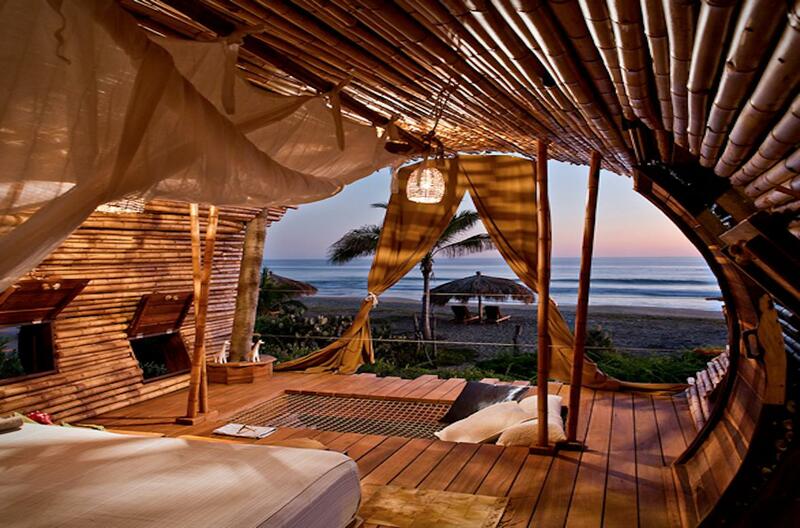 A Zihuatanejo favorite, Playa Viva is all about sustainability and cozy digs that look right out onto the sea. 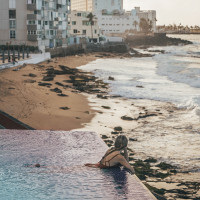 The eight suites at this Mexican resort hover just above the beach and have that sweet combo of feeling luxurious but also comfy enough to call home. 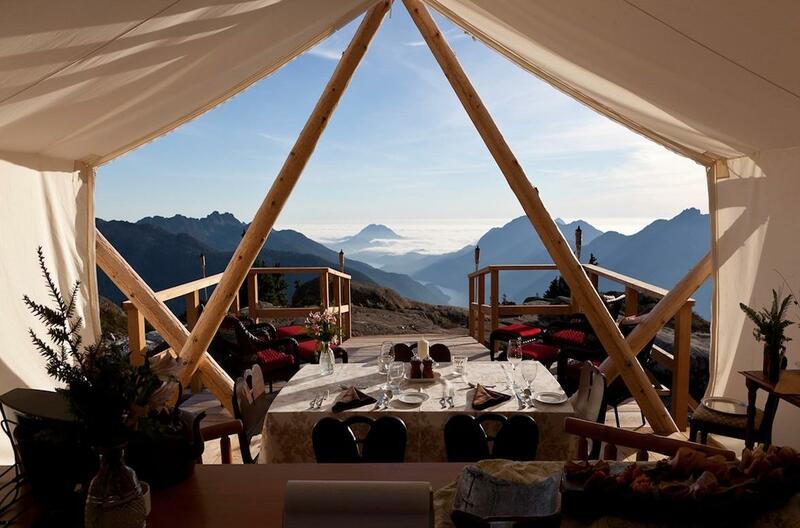 Water babies, we’ve found your ultimate glamping excursion at Canada’s Vancouver Island. 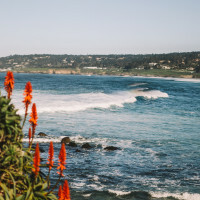 Marine life and plenty of outdoor activity and photo opportunities surround this luxury glampsite that offers whale and bear watching as just a couple of the highlights. 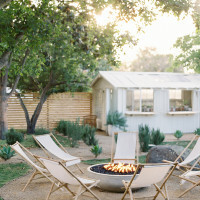 Famed for its ultra-luxurious accommodations on the Big Sur coastline, Ventana Inn recently launched their own take on the glamping experience. 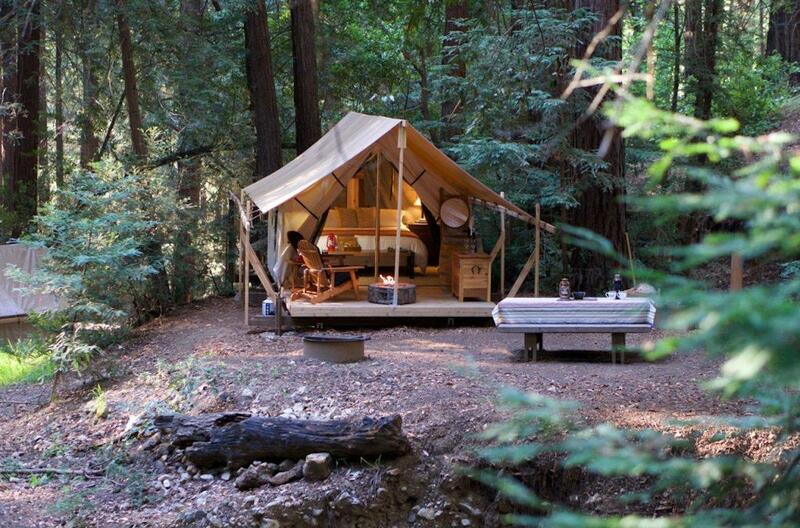 Offering 15 canvas tents with daily turndown service, these beauties open right up to some of Big Sur’s best hiking trails. 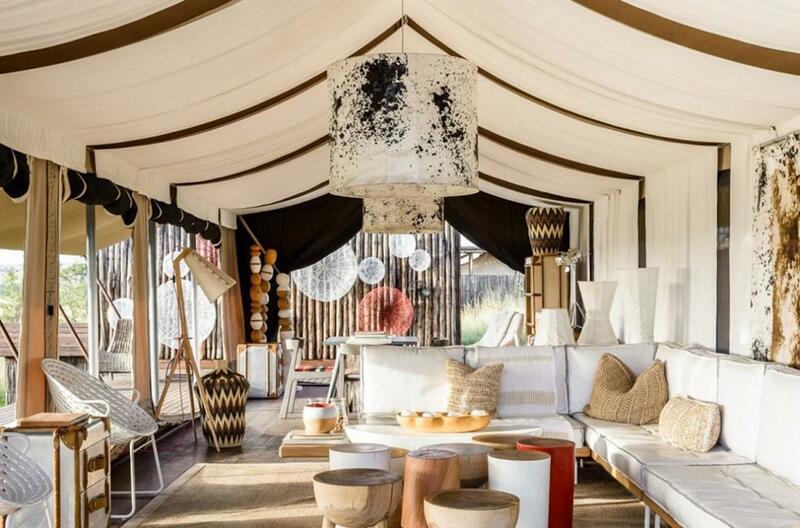 A mobile safari experience in the Singida Region of Tanzania, this collection of a half-dozen glammed-out canvas tents relocates with the movement of wildlife. Depending on the time of year and the season, you may find yourself in a different location observing different animals each time you visit Singita Explore. 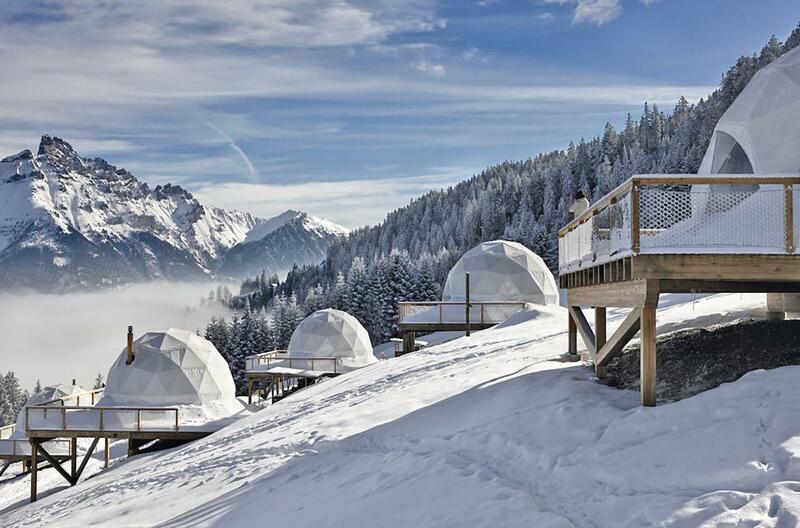 An authentically Alpine experience, the geodesic domes at Whitepod sit overlooking the Swiss Alps. 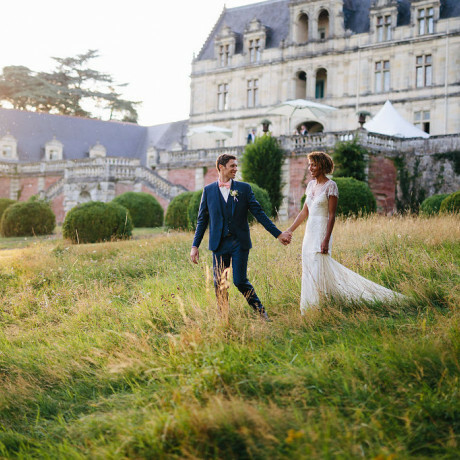 The rooms are chic and comfortable, but it’s the views that really steal the show. A Malibu ranch with cozy sleeping yurts, teepees and gorgeous views of the Ojai Mountains, Great Spirits feels eons away from city life. 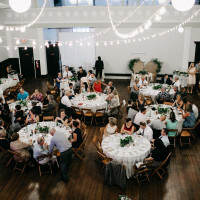 Hop up to this spot for a weekend of glamping or an intimate wedding celebration. 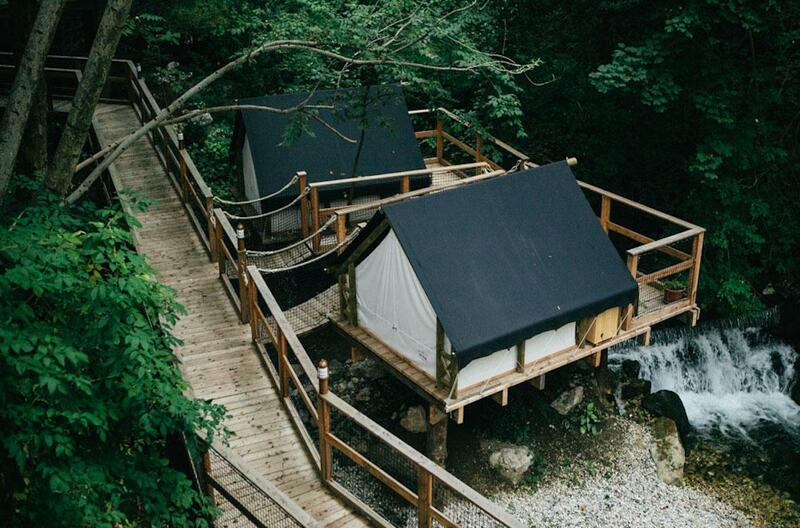 Good design, beautiful lakeside scenery and charming gardens abound at this Slovenian glamping getaway. 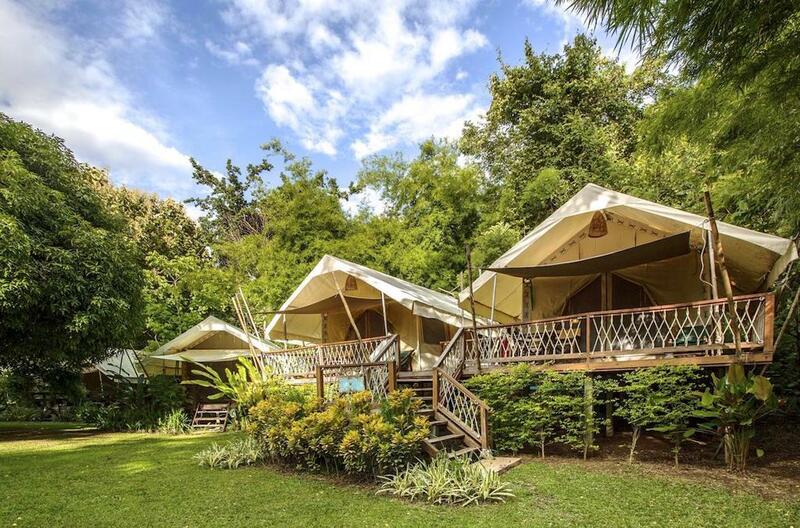 With safari tents, treehouses and tents on the docks, there are various viewpoints and accommodation styles at Garden Village. 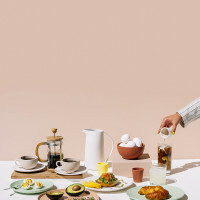 Leave it to Tulum to put a local spin on the tried-and-true bell tent. 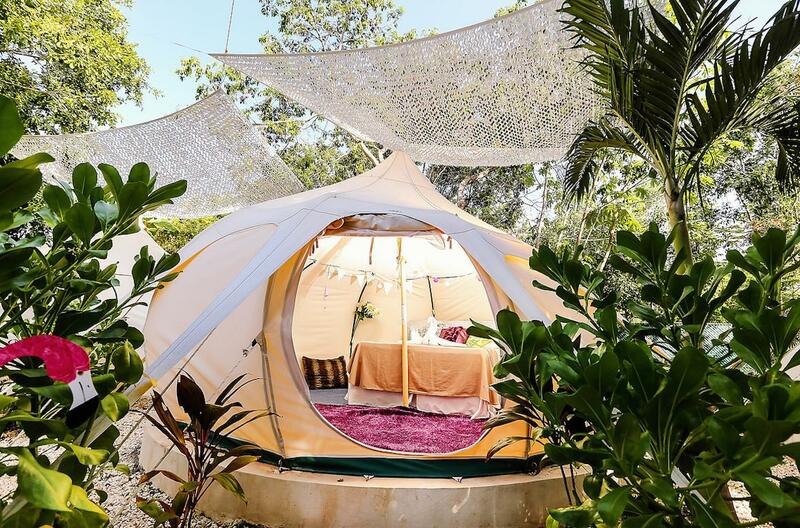 This collection of seven canvas tents sits in the town of Tulum and boasts its very own organic farm. 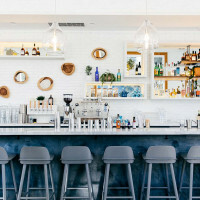 Harmony is a great way to do Tulum on a budget. 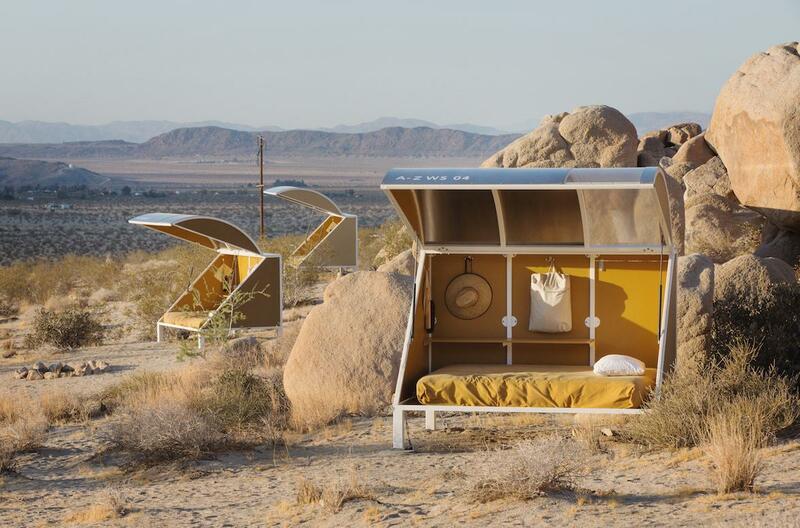 Artists, you may have heard about some sleeping pods out in the desert of Joshua Tree where you can set up shop for a week of hiking through the desert and connecting with fellow artists. 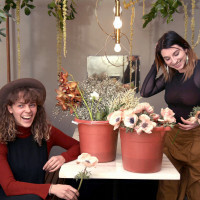 A-Z West is the spot, and it’s set up as an artist’s way of experimenting with how we live. 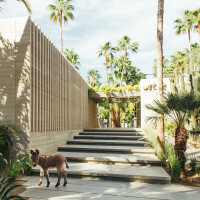 From sleeping pods to a shipping container compound to the artist’s own home, there’s a lot to feel inspired by at this Joshua Tree experimental living project. 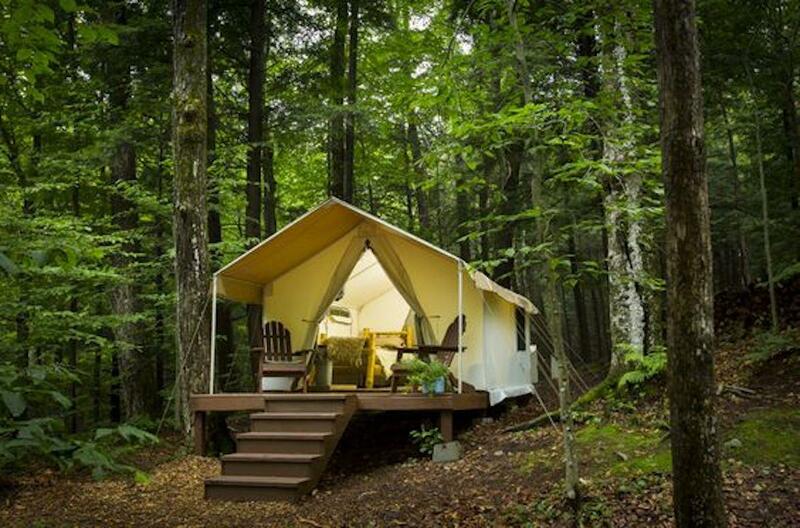 New to the Michigan resort scene, Bella Solviva is home to safari tents, hobbit houses, teepees, treehouses, and fully furnished RVs. 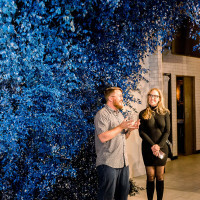 An eco-resort that celebrates the great Michigan outdoors, this spot will have you feeling like you’re taking part in a forest bath. 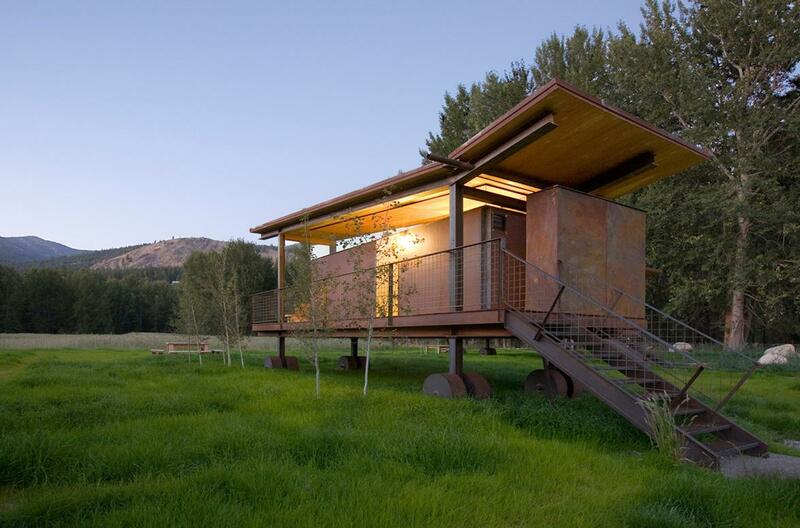 These stand-alone huts and safari style canvas tents in Washington’s Methow Valley are some of the Pacific Northwest’s best camping grounds. 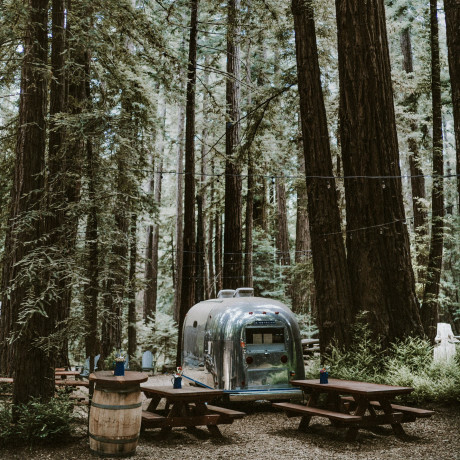 A little bit rustic but also a little bit fancy pants, Rolling Huts has something to offer any adventurer on a mission to explore the valley’s landscape. 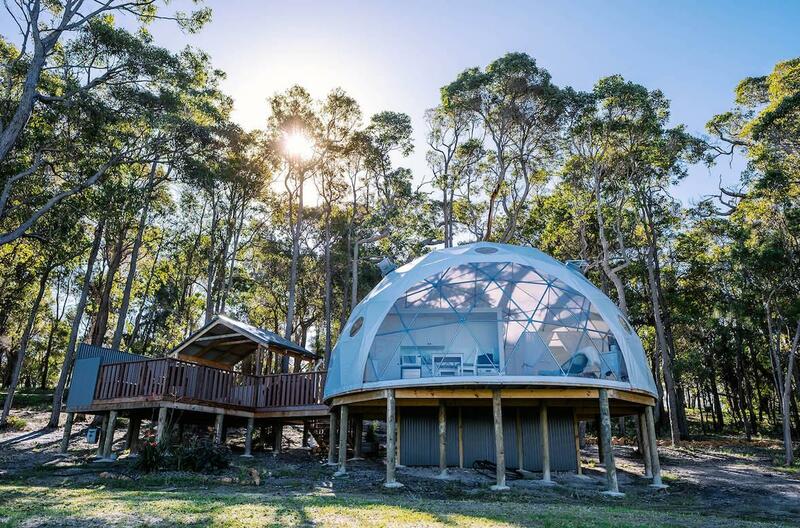 These glam little geodesic domes look right out onto the lush territory of Australia’s famed Margaret River region. An area that’s known for its stunning scenery and prolific wineries, you’d have to be crazy to run out of things to do and places to explore around here. 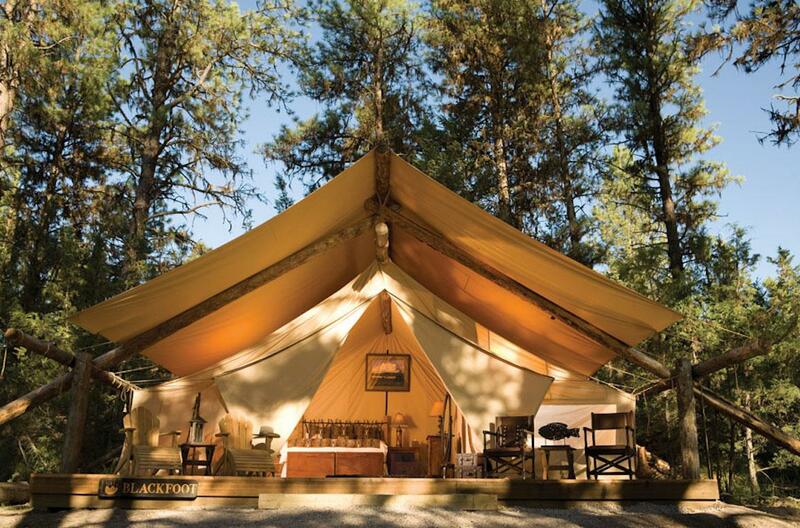 One of the most famous glamping hotels in America, the Resort at Paws Up has been written up in just about every travel magazine out there. And for good reason too! 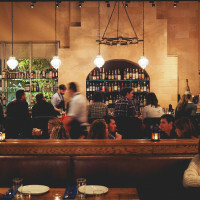 Not only are the accommodations plush, but the food is amazing and the ambience is top-notch too. 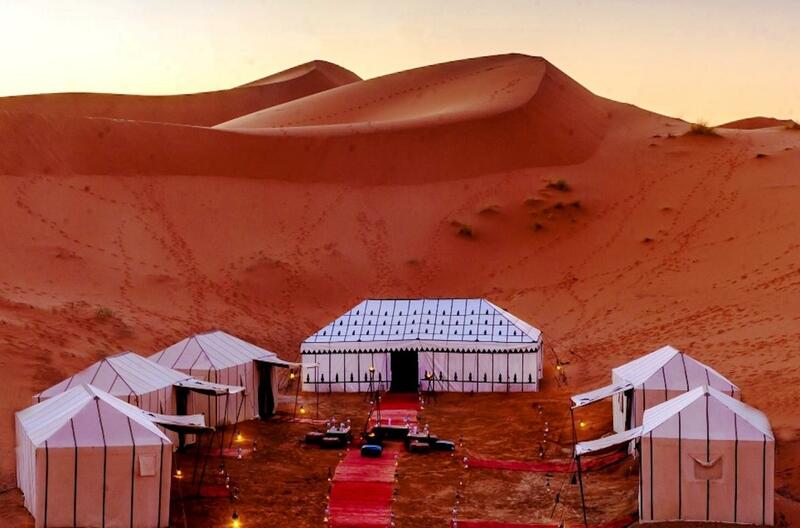 Nestled in the sand dunes of the Moroccan desert, Merzouga offers private and luxurious tent sites that can be accessed by camelback, helicopter or 4WD. 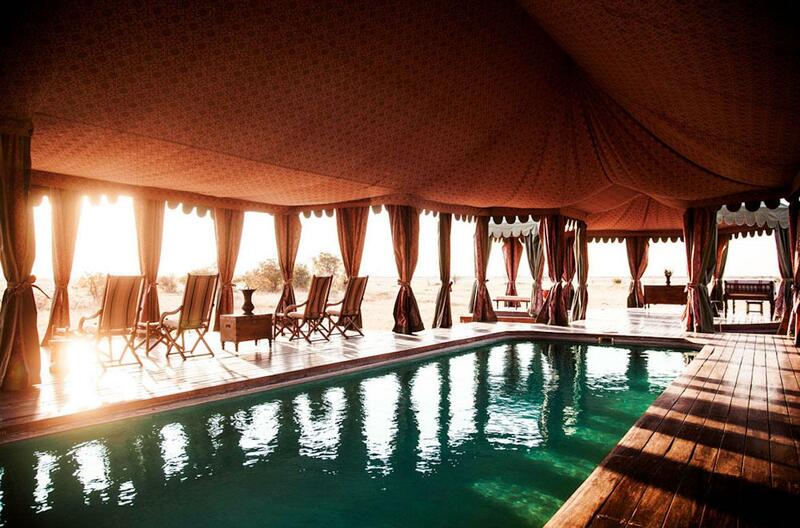 If silence is what you’re seeking, you’ve come to the right place to be pampered and enjoy the vast expanse of the Sahara. Known for its gorgeous gorges, Ithaca is a hot spot for campers and hikers looking to trek around Upstate NY. Rather than pitch a tent after a day of adventure, might as well roll on into one that’s already setup and decorated to a T at Ithaca by Firelight. Once home to a POW camp during World War II, this Thailand river camp is steeped in history and serves as homage to the British soldiers who once occupied the grounds. 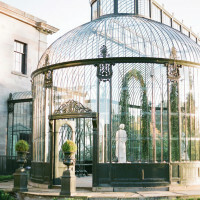 There’s a museum on-site filled with POW artifacts and the bell tents of today are modern and luxurious. 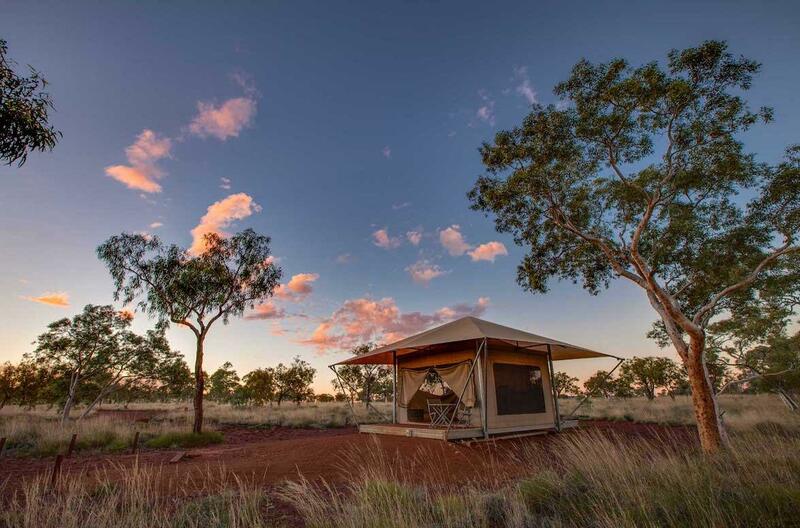 The eco-tent accommodations at this Western Australia retreat are just part of the excitement. Looking out for wildflowers, red kangaroos, wallabies, echidnas, gigantic bats, and all the colorful Aussie birds of this region is really the biggest part of the excitement. 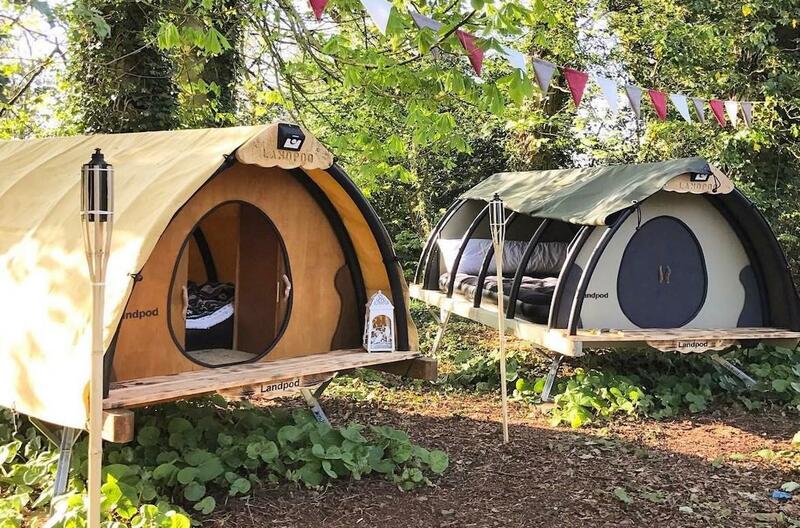 These teeny little portable pods can be toted all around the countryside to glamp in style wherever you should roam. 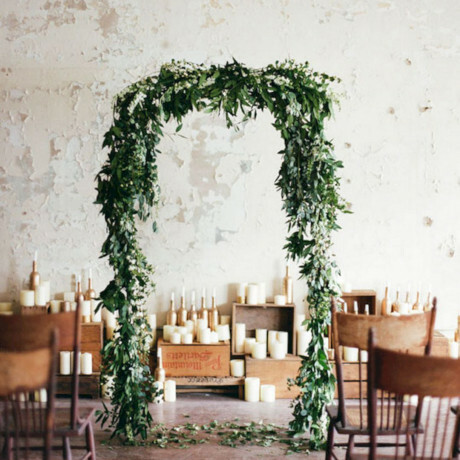 These cuties take just twenty minutes to set up, so they’re an awesome alternative to a classic tent. These gorgeous portable tent cabins run entirely on solar energy and can be installed anywhere you see fit for a glamping trip. 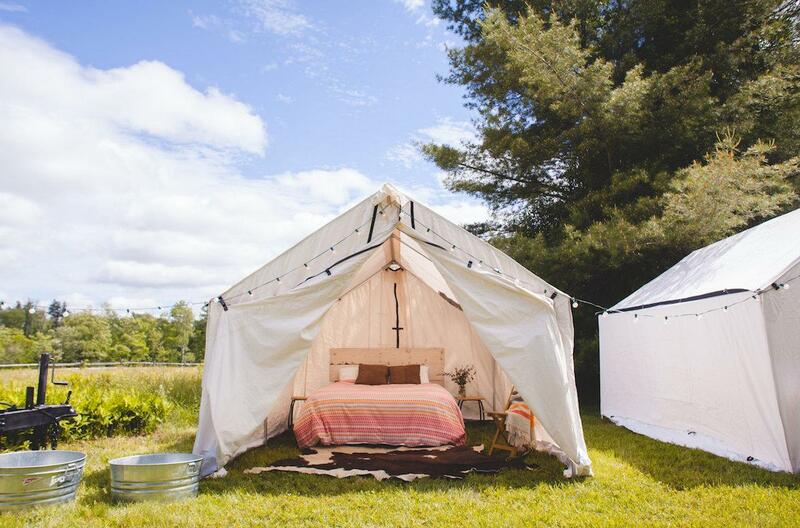 Once you invest in one, it’s yours for life, so we highly recommend these Autonomous Tents for glamping lifers. 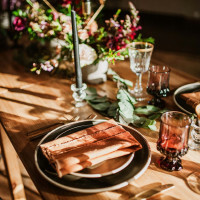 Best known for their cocktails-on-wheels RV experiences, Hive also offers up fully furnished luxury tents that can be popped up anywhere in the New England region. 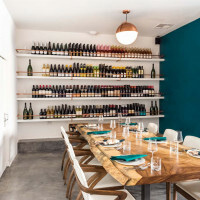 Book them as a pairing for a crazy weekend with your closest kinfolk. 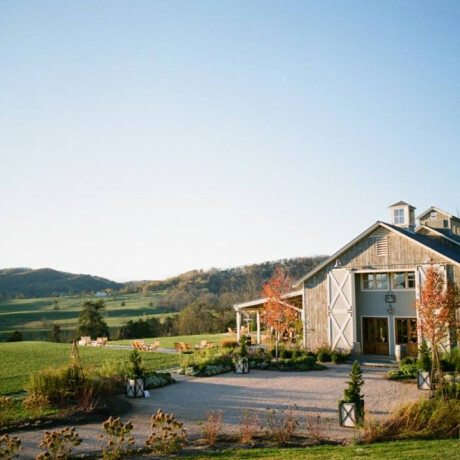 There’s a five-star guest ranch in Montana’s Rocky Mountains? Say whaaa? 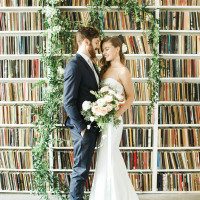 Yep, that has our attention too. Especially because there’s a solid chance that you could ride around on horseback all day long before crashing for the night in a gorgeous little decked out tent under millions of stars. 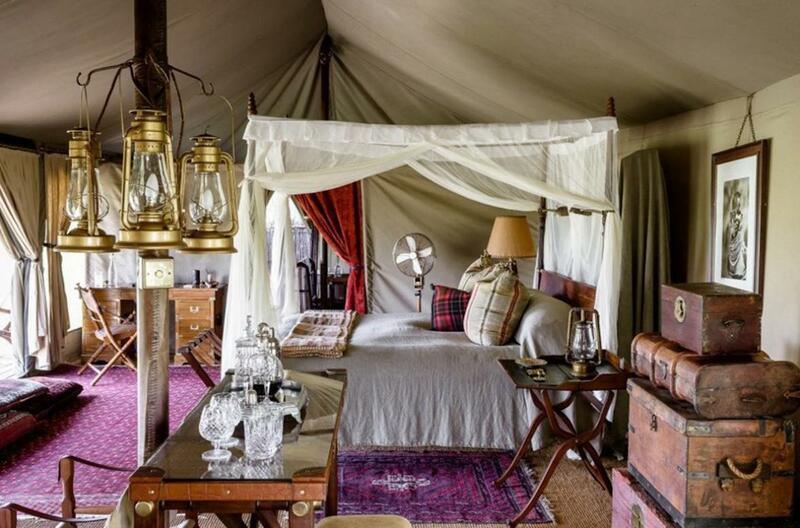 With six canvas tents set up in East Africa’s sprawling plains, Chada Katavi is off the beaten tourist path of Tanzania. 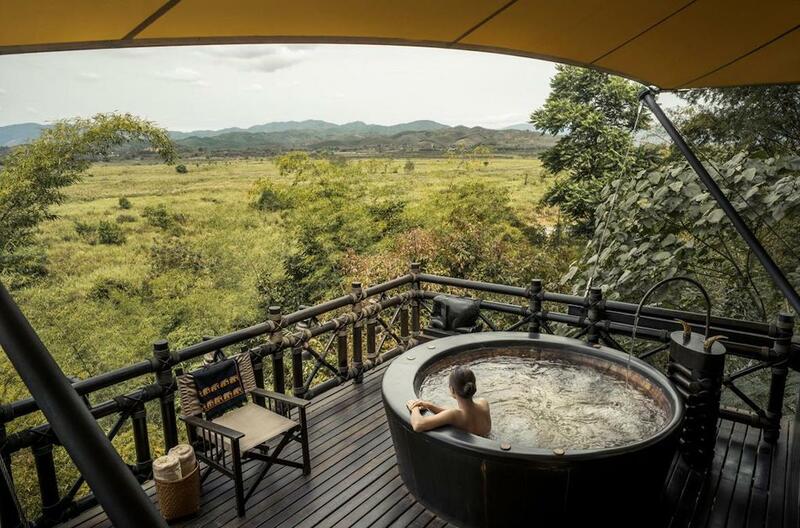 This safari-centric getaway allows guests to feel like they’re part of the landscape, providing a front seat to the wildlife action. A glamping list wouldn’t be complete without a chance to see the Northern Lights. 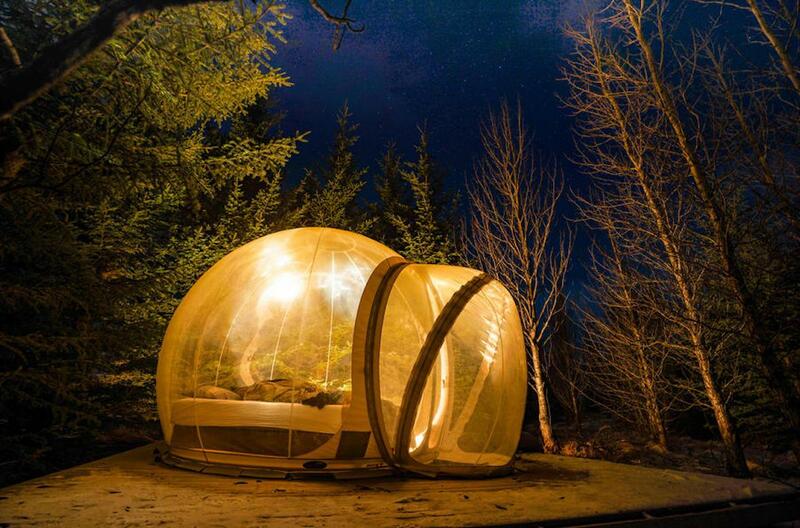 This Iceland bubble hotel is home to a handful of clear-span bubble rooms that are fully furnished to be ideal gazing spots for Aurora Borealis. They even take it a step further and offer a trip to the local hot springs, waterfall and secret lagoon. 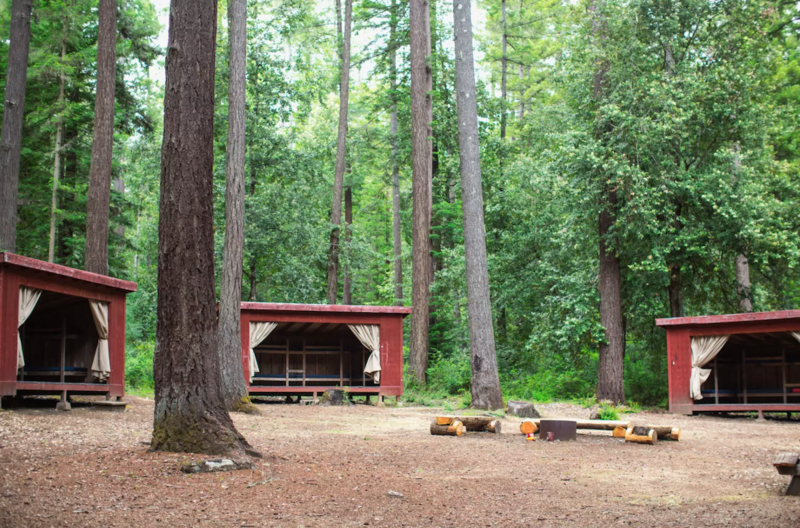 One of coastal valley’s best-kept secrets, Camp Navarro is an old summer camp in the redwood forest that dates back well over a hundred years. 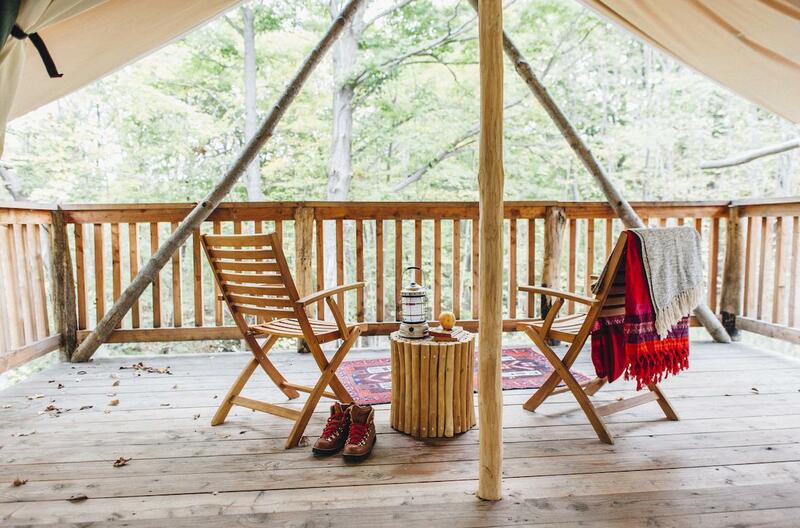 With a mix of old-school cabins, Adirondack cottages, RV sites and glamping teepees, there’s no shortage of sleeping spots for you and your whole weekend getaway crew. 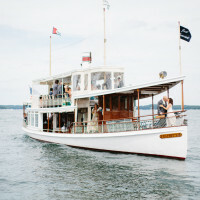 Whoever said you had to leave the country for a true safari experience was clearly misinformed. 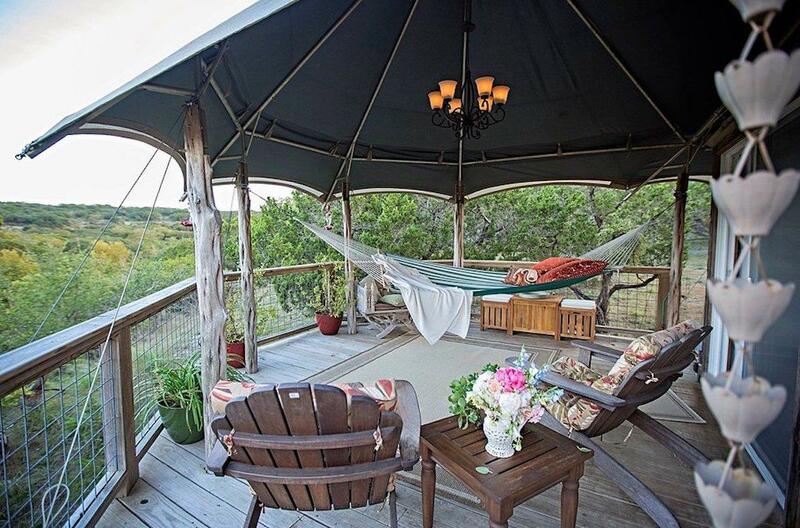 This Texas Hill Country glamping pad is just 45 minutes from Austin and shows off the vast wilderness this beautiful area has to offer. 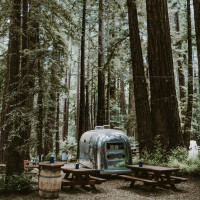 Check it out if you want to camp but with all the amenities of a fancy hotel. With cabins, treehouses, cottages, villas, and camp casitas, there’s no shortage of accommodation options at this Belize creek site. 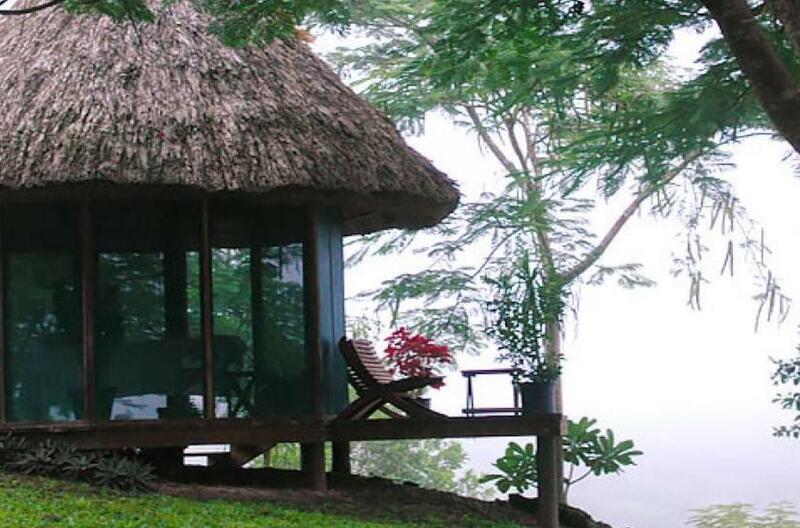 Glamping at the Macal River Camp is down-home in its simplicity, surrounded by rainforests filled with peccaries, armadillos, monkeys, toucans, parrots and a host of other exotic animals. 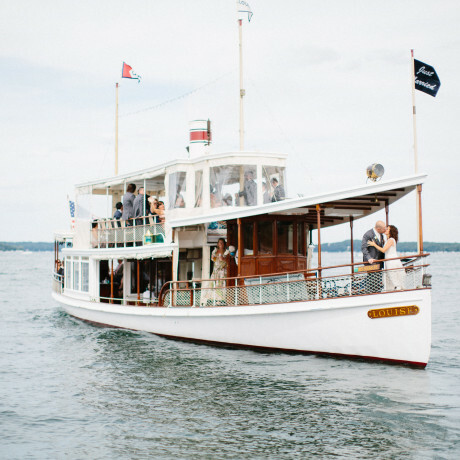 Still can’t decide where to setup shop for a long weekend of reconnecting with your main squeeze? 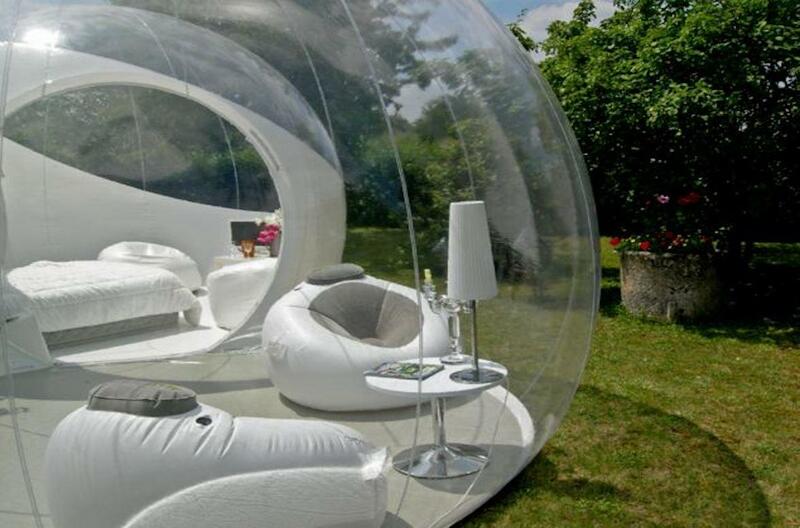 Well, you could just splurge on a bubble tent of your very own and commit to glamping any time, anywhere.